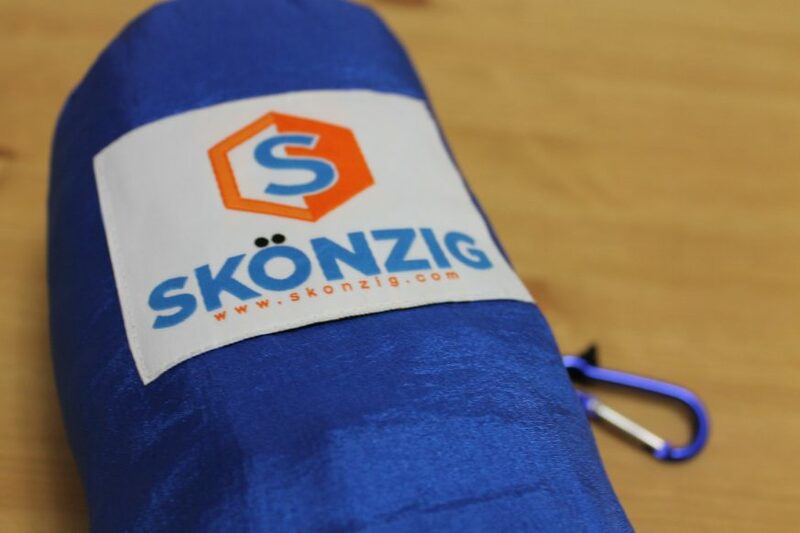 I was recently sent a hammock from an amazing company called Skonzig. 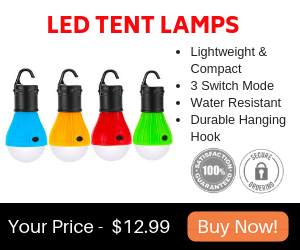 According to their website, they currently sell hammocks, firewood carriers, and mosquito repellent bracelets. If you’re interested in purchasing these kinds of products, definitely check them out. As far as testimonials go, nearly all of the customers had positive feedback. 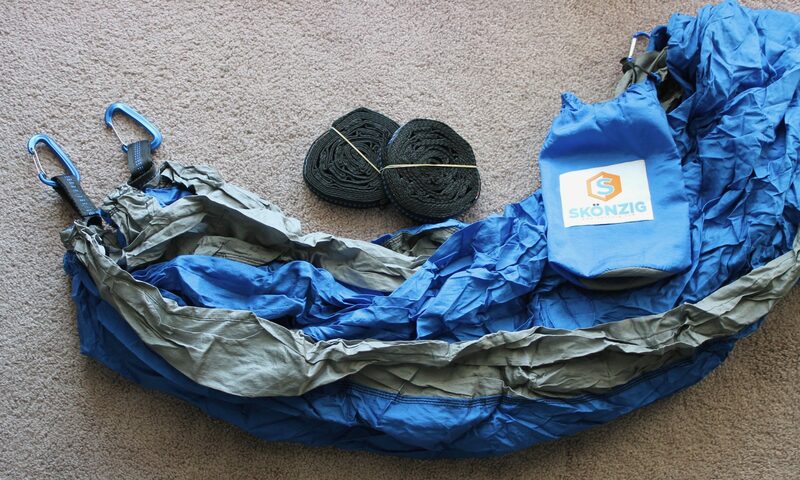 Many have said that Skonzig products are good quality and work well, as I can attest to with their double hammock. My first impression of this hammock was positive because it was packaged nicely and had not been damaged from shipping. It was wrapped in a plastic bag and zip-tie, so the fact that it was well protected and unharmed was a good sign. This lead me to believe that it was a high-quality product. I was impressed by the hammock guide that was attached to the packaging as well. The paper is very thick so you don’t have to worry about it easily ripping. The design is very simple, easy to read, and professional. It also has great graphics that go along with the words. On this guide, it has features, directions for use, tips, and warnings. It also advises to hand wash with cool water and a gentle detergent. 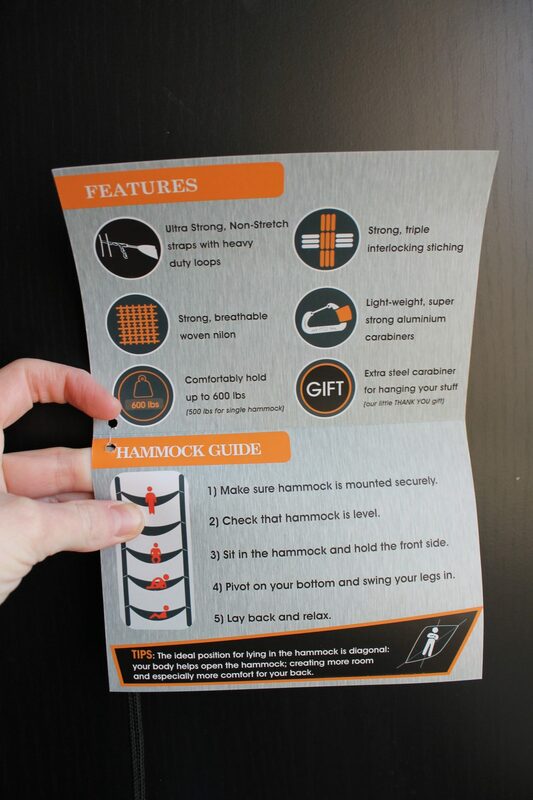 The only downside of the guide is that it doesn’t provide you specific directions on how to set the hammock up. You’d have to look that up on your own, but that shouldn't be a big deal. When I opened up the hammock, I noticed that everything fit nicely inside the bag. As you open the bag, you will find three things: the hammock, heavy-duty carabiners, and tree straps. The tree straps are folded up tightly with a rubber band so that they’re easy to transport and pack up when finished. The color was as expected, with a nice royal blue and grey. When I felt the material, it seemed lightweight but sturdy, which is what you want. The carabiners on each end opened and shut without a problem and I liked how compact it was because that makes it easy for traveling. After taking a look at the hammock, it was time to actually test it. I decided to hang it up on the balcony right outside of my apartment. At first, it took me a while to figure out what to do, just because the directions are not clearly stated on the packaging. However, I was able to look it up on Youtube and once I figured it out, it was very simple. 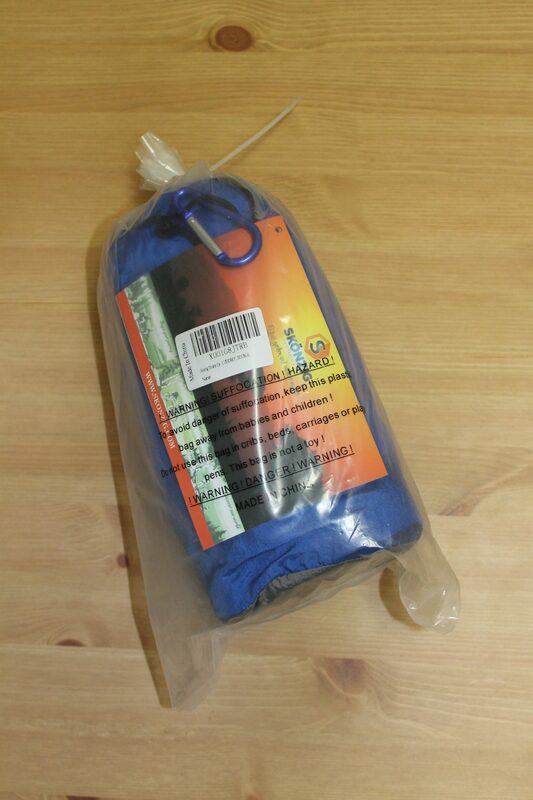 The portable parachute nylon was perfect and I felt very secure as I sat in the hammock. I noticed that the hooks and stitching were strong, which made me feel safe as well. On Amazon, it states the following: “Others may fall off their hammocks due to unprofessional knots or weak carabiners... At Skonzig, we use new advanced method of solid end straps with no knots and the most heavy duty aluminum carabiners to give you maximum support and total peace of mind.” After testing this out for myself, I can definitely agree that I felt safe, which is exactly what I need to be able to relax and feel peaceful while sitting in a hammock. The hammock was definitely big enough for me and another person. My roommate and I were both able to fit comfortably inside with no problems. On Amazon, it says that it can hold up to 600 pounds, so if you don’t go over that, you should be totally fine. My favorite thing about this hammock is that you don’t have to go out and buy extra parts for it. Everything that you would need is included and fits nicely in the bag. The size is perfect and it feels sturdy. Having excellent customer service says a lot about a company and shows that they really care for and value their consumers. I'm all about supporting trustworthy companies and believe that Skonzig definitely fits into that category. 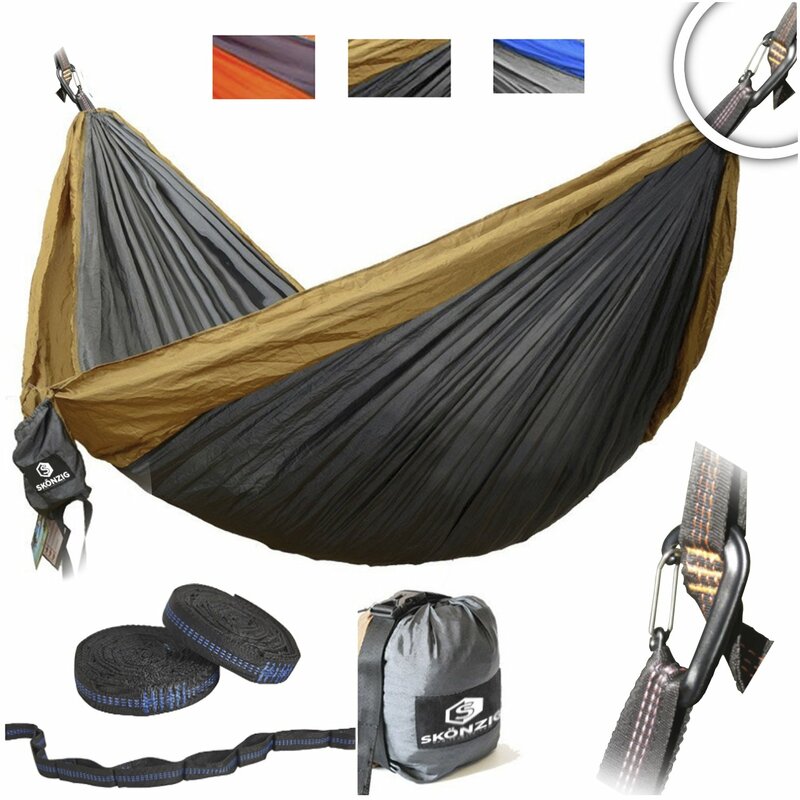 If you’d like to try the Skonzig double hammock for yourself, it only costs $35.50 on Amazon, which in my opinion, is a great price for a high-quality hammock like this. However, Skonzig has been so generous and has offered a discount code for all those who purchase directly through our website. 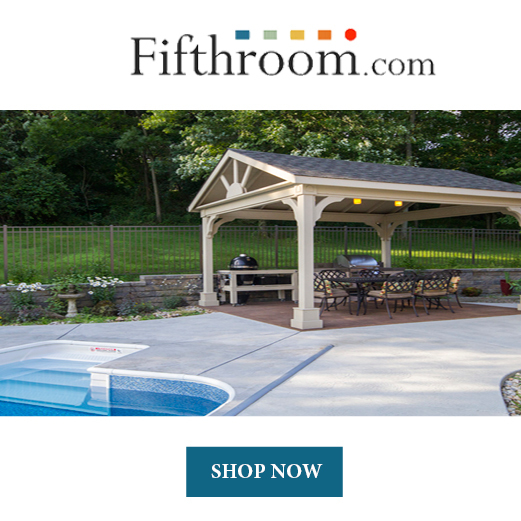 At checkout, apply the code RQ3HV79P to get 15% off of your purchase. Thank you Skonzig! At checkout, apply the code RQ3HV79P to get 15% off of your purchase. Overall, I was super impressed by the quality of this hammock and would highly recommend purchasing it for yourself or as a gift. 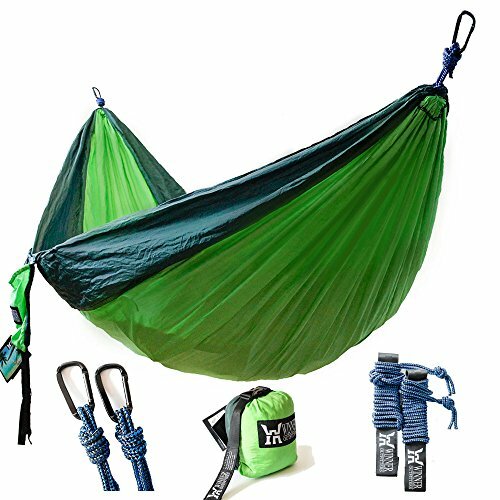 Whether you’re camping in the woods, relaxing in your backyard, or even reading a book inside, this is a great hammock to use. If you're looking for a high-quality hammock at a reasonable price, stop your search right now because you've just found it. What are you waiting for? 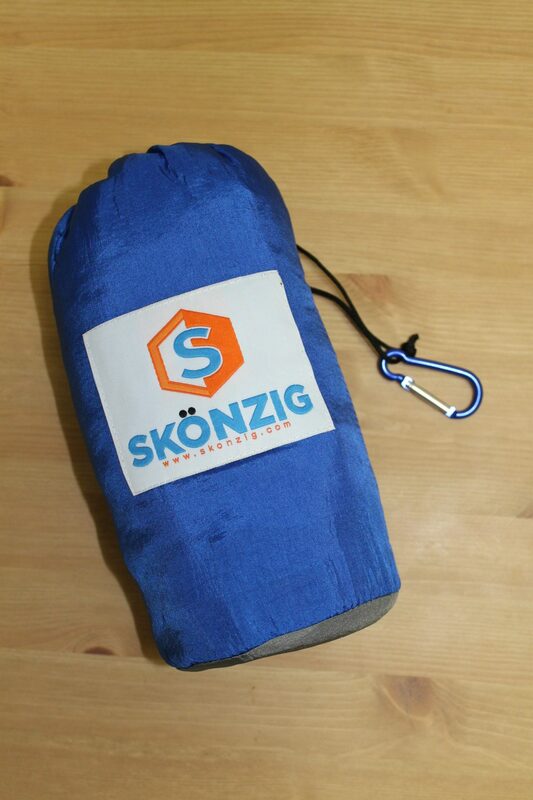 Go purchase your Skonzig Double Hammock today!